Las Vegas, USA－January 8th, 2019－Thermaltake, a world renowned PC DIY components manufacturer announced the release of four high-quality water cooling kits today at the Venetian Hotel Veronese 2402 Suite from January 8th (Tue) to 11th (Fri), including Pacific C240 DDC Hard Tube Water Cooling Kit, Pacific C360 DDC Hard Tube Water Cooling Kit, Pacific C360 DDC Soft Tube Water Cooling Kit and Pacific C240 DDC Soft Tube Water Cooling Kit. All kits are efficient and high-quality combo kits that can sync with ASUS Aura Sync, GIGABYTE RGB, MSI Mystic Light Sync and ASRock Polychrome. 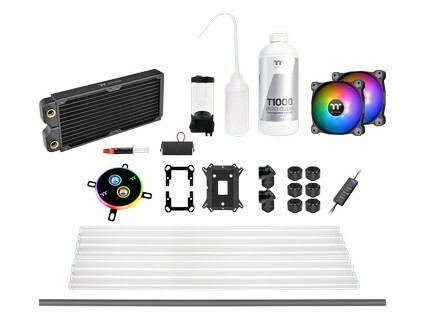 Pacific C240/C360 Hard Tube Water Cooling Kit includes Pure 12 ARGB Sync Radiator Fans, a Pacific W4 ARGB CPU Water Block, Pacific PR15-DDC Pump/Reservoir Combo, Pacific C240/C360 Radiator, a bottle of T1000 Coolant Pure Clear, six C-Pro G14 PETG 16mm OD Compressions, eight V-Tubler PETG Tubes, an ARGB LED controller, and other accessories. As for Pacific C240/C360 Soft Tube Water Cooling Kit, it includes Pure 12 ARGB Sync Radiator Fans, a Pacific W4 ARGB CPU Water Block, Pacific PR15-DDC Pump/Reservoir Combo, Pacific C240/C360 Radiator, a bottle of T1000 Coolant Pure Clear, six Pacific 1/2'' ID x 3/4'' OD Compressions, two meters of V-tubler 4T 1/2'‘(12.7mm) ID x 3/4'‘(19mm) OD Transparent Tube, an ARGB LED controller, and other accessories. Comes with a 16.8 million colors LED ring and 12 addressable LEDs that can be controlled by the included ARGB controller and ready to sync with 5V RGB capable motherboards from Asus, Gigabyte, MSI and ASRock. W4 ARGB CPU Water Block features 0.15mm internal fin construction, a copper base with anti-corrosive nickel plating and high-quality PMMA cover, and a universal mounting mechanism that offers error-free as well as no-tools installation. Fits with most G1/4 fittings, it provides the ultimate in cooling performance, and delivers extreme compatibility for custom PC builders. Thermaltake Pure 12 ARGB Sync Radiator Fan TT Premium Edition features compression blades, hydraulic bearing, and a 16.8 million colors LED ring with 9 addressable LEDs that is ready to sync with 5V RGB capable motherboards from Asus, Gigabyte, MSI and ASRock. Users can easily switch RGB lighting effects using the ARGB controller that is included in the packet, or by ASUS Aura Sync, GIGABYTE RGB Fusion, MSI Mystic Light Sync and ASRock Polychrome software. High-performance C240/360mm slim copper radiator with high-density copper fin design and brass tank. Built for 120mm high-static pressure fans, the radiator is manufactured from premium-quality materials that provide exceptional performance, unrivalled reliability. The unique stainless steel side panels guarantee the durability as well as reduce the weight of the radiator. Integrated G1/4" threads make it easy to install, while rigid connections ensure leak-resistant measures are in place. With an ideal mounting, fitting and flow set-up. 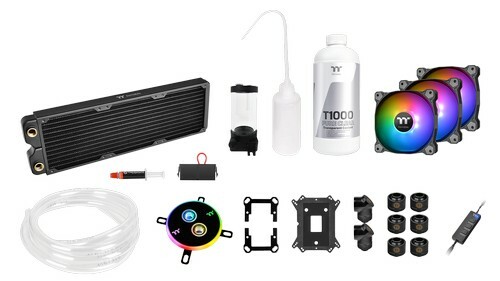 Thermaltake T1000 Coolant Series is designed with TT latest formula to be used as anti-corrosion protection fluid and heat-transfer medium for PC water-cooling. With transparent colors, T1000 allows users to create unique colors by adding TT Premium concentrate. The new formula provides T1000 Coolant Series with color stability and low viscosity that enables effective flow. 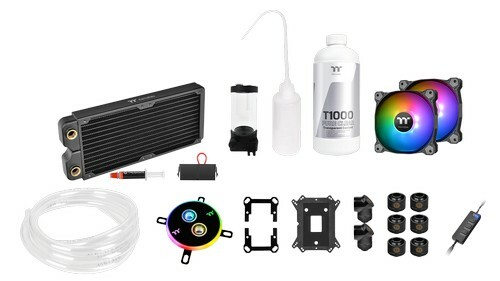 Thermaltake T1000 Coolant Series encourages users to create your own colors for your system! Thermaltake Pacific C240/C360 DDC Water Cooling Kits are now available for purchase, via the Thermaltake worldwide network of authorized retailers and distributors. Thermaltake Pacific C240/C360 DDC Water Cooling Kits are backed by a two-year warranty and supported by the Thermaltake worldwide customer service and technical support network. For up-to-date pricing of the Thermaltake Pacific C240/C360 DDC Water Cooling Kits, please refer to the Thermaltake website or contact your local Thermaltake sales or PR representative.